Class # 205 The Tiny House Journey – Newbury, MA. Sunday, 3/29/2015, 12 – 4 PM $75. *** Openings still available, sign up now!!! Meet a local tiny house designer/builder and learn more about the tiny house movement. Limited to 10 attendees. 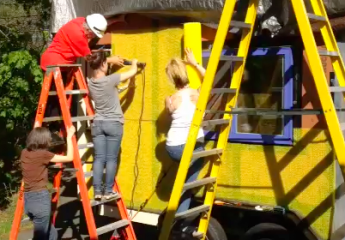 Tour the Silver Bullet Tiny House on wheels and discover all its reclaimed, recycled, non-toxic, sustainable and net-zero waste building materials and systems. How to transition into a sustainable lifestyle will be discussed with practical tips on how to reduce your carbon footprint quickly. “The seminar and tour we had with you was by far the most valuable experience I’ve had from my design class this year.” Devyn D.
Trailer modification, design process, framing, sheathing, insulation and energy systems will be covered. Includes light refreshments, building samples and 30 minute Q&A session. Bring your sense of humor!! 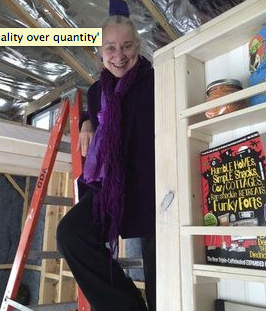 Elizabeth Rose author’s article on Vera’s tiny house in the Newburyport Daily News, click here.